Dr Vincent Power is a Partner specialising in EU law, EU and Irish competition/antitrust law, merger control, regulatory law and transport law for national and international as well as public and private clients. He is Head of the Firm's EU, Competition & Procurement Group which is consistently ranked at the forefront of Irish law firms and he is seen as the most experienced competition lawyer practising in Ireland. In 2017, he won the ILO Client Choice Award for the category of "EU Competition and Antitrust" across the entire 28 Member State European Union and in 2018, he won the same award for Ireland – these awards are made by The International Law Office in recognition of a partner who excels across the full spectrum of client service. 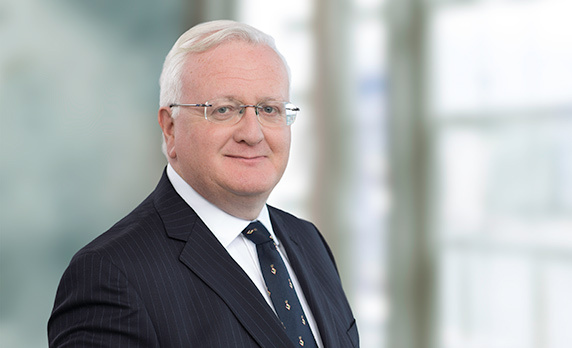 Vincent has advised on most of the leading competition, merger control, EU law, cartel, abuse of dominance, State aid, joint venture, pricing, refusal to supply, competition investigations, Competition Authority / CCPC and competition litigation cases in Ireland over the last 20 years. He has been involved in several hundred merger filings in Ireland and the EU and has experience and expertise in all of the issues involved. He has developed a particular expertise in regard to Brexit Law. Vincent is the author or editor of seven books including "Competition Law and Practice", "Irish Competition Law" and the award-winning "EC Shipping Law". He has been invited to speak on EU, competition and transport matters in over 20 countries. He has a Master's Degree and a Doctorate from Cambridge University and was the first ever Law graduate to be awarded the Distinguished Alumnus award from University College Cork where he graduated with a BCL. He is Adjunct Professor of Law at University College Cork and Visiting Professor of EU Law at Dalhousie University in Canada. He lectures at the Law Society of Ireland. He is a member of the board of directors of the Irish Centre for Europe Law at Trinity College Dublin. He has chaired, been a member of and advised four governmental commissions or bodies. He is the former Chairperson of the Irish Society of European Law and has also been appointed as the Comité Maritime International's EU Shipping Law Rapporteur. Vincent won the "Irish Commercial Lawyer of the Year" at the inaugural Irish Law Awards.